Aw! 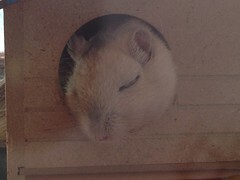 Look at my happy, peaceful little gerbil friend. He is so relaxed and calm and sleepy. Double aw! 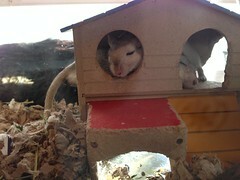 That calm happy gerbil is sleeping with his buddy. Make that ON his buddy. ...except for the giant predator smashed between the gerbil tank and the window. It must be unsettling to always have a giant cat on one side of your tank and a giant human on the other. 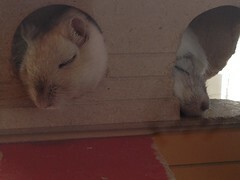 It's a miracle these gerbils aren't stampy* little stressballs all the time. Meanwhile, our predator finds time to pose, secure in the knowledge that no human or rodent will be able to pry her out of her exactly Oreo-sized stronghold wedged between the window and the gerbil tank. And there you have a photo tour of two feet of my desk. And a good idea of exactly how much time I have on my hands. * Gerbils do an excellent double stamp move to alert each other of danger. It is très adorable. Video of that double-stamp. Pleeeeeease!!!! 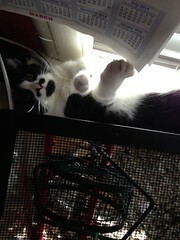 Also, you must start a comic strip of Oreo, just watching the gerbils all day long. I need rodents in my life. Gerbil fan club member right here. LOVE THEM! It slightly concerns me that I could guess where this post was going, based on the title and the first photo. Picture me sitting in front of the gerbil tank with my camera at the ready trying to make alarming noises to get the gerbils to stamp. Everybody needs rodents in their lives. 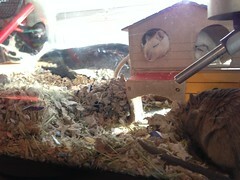 These are my boy gerbils. They are giant. My girl gerbils are probably half their size. 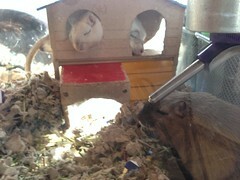 They are EXACTLY like little architects, always renovating. They are, aren't they? They look very sweet when they're sleeping. I agree - a video of the stamping is a must!